I was supposed to appear at my MA final exam in October 1948, but I decided to wait for another year. This was because I was not satisfied with my preparation due to my busy schedule as the General Secretary of Fazlul Haque Muslim Hall Union and for some other personal issues. However, I later realised that this was the wrong decision. I attended my classes regularly and always made a note of the lectures. It was a great mistake not to appear in that year’s exam for the sake of achieving a better mark. No good student would want to lose an academic year and my misjudgement cost me one and a half years. I do hope that no one makes this same mistake in their life. Due to the Hindu-Muslim riots, which happened twice in the latter half of 1949, I lost a further six months. I was supposed to obtain my MA degree in December 1948, but due to my erroneous decision I was unable to receive it any earlier than August 1950. During the exam, by the grace of Allah, out of the four papers, there was only one question that I was not prepared for. No one received a first class in political science that year and I was one of four students who obtained a high second class. My classmate in my MA final year, named Kafiluddin Mahmud, with whom I would play carom and volleyball regularly, received a first class first in the MA exams of 1948 and immediately joined the university as a lecturer. Incidentally, he examined the paper that contained the one question I was unable to answer. He felt sympathetic towards me and asked why I didn’t do well in that question. I felt embarrassed that my classmate had become my examiner and regretted my decision not to appear in the exam in the same year with him. Kafiluddin Mahmud later joined the civil service and was one of the advisers of the 1991 Caretaker Government of Bangladesh. I embarked on my spiritual journey with Tablighi Jamaat after appearing in my MA final exam in March 1950 and returned to Dhaka in July 1950 after completing three chillas (four months). Upon returning to university, I came to know that the date of my oral examination had been announced. At that time, the oral examinations would take place after the written examination results were ready, unlike now, when they take place immediately after the written exams. I came to know during my viva that I had done very well in three papers and was asked why the fourth paper, which cost me a first class mark, was not as good. The teachers seemed satisfied with my performances in the oral exams and, when the results were declared in the first week of August, I came to know that I was the second out of four that obtained a high second class. I had decided during my third Tablighi chilla that I would begin teaching as my profession. I met the head of the department who told me that I could not apply for lectureship at a university as I did not hold an honours undergraduate degree and the only way it could be compensated for was with a first class master’s degree. Hence, I missed that opportunity too, whereas one who had a third class undergraduate degree and fewer marks than me in their master’s degree was able to join the university. I sent applications to four famous university colleges with all my certificates, although I was unaware of whether any of the colleges had a vacancy. While I was looking for jobs after the MA final exams, I went to see the Accountant General Syed Mohammad Jamil who had met me in Tablighi Jamaat and had asked me to visit him after the completion of my third chilla. He was from Northern India and was very affectionate towards me in Tablighi Jamaat, and that relationship continued for many more years. During my exiled life, I met him once in Libya in 1973 at an international youth conference where he sincerely prayed for my life in exile to end. I realised at that time that when people develop a deep love for Allah, their hearts become very soft towards fellow human beings. When I met Mr Jamil at his residence in Dhaka, he hugged me affectionately and asked me to join his office in the position of an upper division clerk until I obtained the job of my choice. He said, “Hundreds of people work in my office; all upper division clerks are graduates and the lower division clerks are not below matriculation. I have increased the prayer break for the noon prayer (zuhr) to 45 minutes so that someone capable of speaking about Islam can speak about 20/25 minutes after the prayer. However, I am not too happy with their speeches. I have heard you speak many times and would like you to expound Islam to our employees after joining here. I hope you will not decline in doing this service for Islam.” I had no intention whatsoever to do this kind of job, but could not refuse the affectionate demand of Mr Jamil. I thought that it was a good idea to be occupied until I found a proper job. I could get some experience and simultaneously provide some service to Islam and also receive enough money that I wouldn’t need to ask my father to cover my expenses. Hence, I agreed to join. He asked me to apply that very day and gave me the form, telling me that interviews were held every week and that someone like me would get selected easily. I received a letter for an interview within four days of applying. I then attended the interview two days later and joined after three days. I was among 25/30 clerks under a senior superintendent. He was very caring and as I was new he would often come to my desk in order to help me understand the work. Most of the work was accounting, which I didn’t enjoy, but I continued to do it for the sake of completing a job. The officers would deliver the speeches after prayer and one of them introduced me and asked me to speak a few days after I joined. It seemed that the audience liked it. However, some senior clerks did not like the fact that a junior clerk was delivering an officer’s job, and I could hear some mutterings around. With Allah’s mercy I saw my acceptability increase after speaking for a few days. If someone displayed an interest in the topics I discussed, I would send them to the Kakrail Mosque to attend Tablighi Jamaat programmes. I worked in that office for only forty days and I was able to encourage 8 to 10 people to join Tabligh during that time. I then explained to him the thoughts that led to the decision that I made whilst at a Mosque in Rangpur during my third chilla. Hearing this, he hugged me, kissed my forehead and said, “My love for you has grown even deeper after seeing your courage to reject such a big offer. May Allah accept you for His deen. Government jobs are not appropriate at all for a person like you. You have made the right decision.” When I returned and relayed this to my father, he said, “You have to make your own decision about these things, but always remember to take decisions with full confidence in Allah and with the spirit of Islam in mind”. I was asked to lead another Tablighi chilla to train some educated youths. When I informed them of my applications to colleges and the job I was working at the time, I was asked to apply for leave and was told that they would keep in contact with my father and inform me if I had an interview call. However, I could not get long-term leave due to working for only over a month, so after only forty days of serving in that office I resigned and went for the chilla. After completing the chilla in October, I returned and continued to work for Tabligh in Dhaka and its adjacent areas as I didn’t have any job. In mid-November 1950, I got a telegram from a college to attend an interview, but was surprised to see that there was no mention of the name of the college or the district. The only name that was mentioned in the telegram was the telegram office, Alamnagar, from where it was sent. I was confused as to where the letter was from. I heard that there was a vacancy in the Political Science department at Pabna Edward College, so I went there for the interview only to find that they hadn’t sent me any telegram. I then went to the telephone office and was informed that Alamnagar was in Rangpur, so I decided to go there immediately. I missed the interview date as I had been to Pabna, so I reached Rangpur the day after the interview and went straight to the residence of the principal. I was pleasantly surprised to find that the principal was none other than Mr Abdul Hakim Qureshi, who was my principal at Islamic Intermediate College for four years. He also taught me Shakespeare’s Julius Caesar during my intermediate class. I said, “Sir, if I knew you were here I would have come to see you a long time ago.” He received me with a cordial handshake and asked why I came a day after the interview. When I informed him the reason he got very annoyed and said, “That head clerk is a fool. How could he send a telegram like this? Please don’t mind this, as it was not your fault”. I asked him in a low, worried and sad tone, “Sir, will I be given another chance to give an interview?” He replied, “There is no need for an interview. I have already decided to appoint you due to your qualifications being much better than those who came for the interview and my personal acquaintance with you. Return tomorrow to receive your appointment letter and join on the given date.” From the core of my heart came out the expression Alhamdulillah to express my gratitude towards the Lord and my whole existence felt a deep sense of satisfaction. This proves the power of Allah’s decisions, that I could be appointed even without an interview. On the other hand, if He doesn’t approve something, then no amount of effort can lead to success. As mentioned before, it was during a late night in May 1950 while at the Keramotiya Mosque in Rangpur that I decided not to do any government job and take up teaching as a profession so that I could give more time to the cause of Allah. It was His wish that it was in Rangpur above all where I could start my teaching career. I had sent letters to three other university colleges, but none of them replied, whereas Rangpur Carmichael College appointed me without an interview. Two other colleagues received appointment letters the following day. They were Professor Zamir of Bangla and Professor Kalim of Philosophy. I joined the political science department. After receiving my appointment letter I returned to Dhaka that evening. A high official responsible for financial records during the British rule, also known as “Her Majesty’s Service”. My father came to see me at my university hostel two months before my MA final exams. Saying, “Come, I will take you somewhere,” he took me to a mosque in Narinda. On the way he didn’t tell me where we were going and for what purpose. As soon as we entered the mosque, I noticed 25 to 30 people doing munajat. The person leading the proceedings was using very emotive language. I had never heard someone doing munajat in Bangla in such an appealing style and I observed that he was crying out loud and everyone taking part was also crying. The words touched my heart and tears came rolling down my cheeks freely. I felt an unprecedented pleasure in praying to Allah that filled my heart. After the munajat my father introduced me to the person who was leading it. He was very handsome and I felt an instant connection with him in our first meeting. 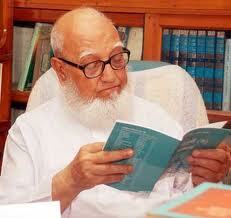 He was the president of East Pakistan Tablighi Jamaat, Mawlana Abdul Aziz. I came to know that he was already well-acquainted with my father and it was a humbling experience when he hugged me with deep affection and won my heart immediately. He advised me to pray the isha prayer at Lalbagh Mosque every Thursday, where regular Tabligh events used to take place. I later came to know that the language of the munajat that touched my heart was actually a translated version of some verses from the Qur’an and some famous Hadith. I realised that our Omnipotent Lord is so merciful that he taught us the best possible language to seek His blessings. Allah ensured that the language of our demands to Him is up to such a standard that all aspects are covered appropriately. There is no need to send a formal application to Allah. Even an illiterate person can also express their feelings to their Lord in their own language. The following Thursday I reached the Khan Muhammad Mosque in Lalbagh as advised by Mawlana Abdul Aziz. After the isha prayer, I noticed around 7 or 8 people sat together who were greeting each other smilingly. I felt that they were Tablighi brothers and this was confirmed by one brother who cordially welcomed me to the group. When they came to know who had recommended me to come, and that my father was a friend of their leader, the welcome became more emotionally charged with affectionate handshakes all around. Kalimah – the first article of faith declaring Allah as the only one to be worshipped and Muhammad (PBUH) as the messenger of Allah. After the meeting it was time to eat and people took out the food they had brought from their homes. I was the only person who hadn’t brought my own food. I was not aware that I had to stay until the Morning Prayer, so I hadn’t had my dinner. I was feeling quite embarrassed, but others made me feel comfortable and almost forced me to eat their food. I was also told that I would be their guest every Thursday and didn’t need to bring my own food. The activities of Tablighi Jamaat include going out in groups to invite people to join the movement and teaching people the six principles, how to perform sincere prayers, the proper pronunciation of the Qur’an, different types of dua, etc. In order to become an active member of Tabligh one must give a long time for this cause, by going on a Chilla (a spiritual journey) in three cycles, each consisting of forty days. Those who are able to spend these four months in this cause are considered the core members of the movement and are given the responsibilities of leadership at different levels. I completed the three Chillas after my MA final exams. The first and the last Chilla were spent in my own country, while the second one was spent in Delhi – the headquarters of the Tabligh movement. The 20-member group in my first Chilla was led by the president of the East Pakistan Tablighi Jamaat, Mawlana Abdul Aziz. I learned a lot in the first ten days of that spiritual journey due to my close acquaintance with Mawlana Abdul Aziz. I memorised some important verses from the Qur’an and also learned a lot of Dua from him. He found in me a sincere disciple and asked me to be with him all the time. I used to ask him many questions and he answered them with love and affection. The respect I felt for him was not felt for anyone else. Suddenly, after the tenth day, Mawlana Aziz told me in front of everyone else that I had to lead the group for the rest of the journey as he had to leave to attend a central meeting of the movement in Dhaka. I was not sure what others felt, but I was dumbfounded at this sudden decision and stood there surprised and tense. Observing my reaction he hugged me and said, “I joined this group to prepare you for leadership. I am confident that you will be able to lead this group efficiently. You are the leader of this group from now on and I will spend my last three days in this group under your able leadership”. My confidence was boosted when other members expressed their allegiance to my leadership. Yet, I was finding it difficult to come out of the shock and told Mawlana Aziz with tears in my eyes, “I have been learning many things from you in the last ten days. I am worried that I now have to lead the team with only ten days of training.” He consoled me saying, “Allah directly helps those who work in His cause. As you go on teaching others your knowledge will also increase naturally.” However, as he was still around for three more days it was easy for me to get into the leadership mode as I was able to get important tips from him whenever I needed it. I was told after my first Chilla that the second one will be in Delhi and that I would be accompanied by another person from Dhaka, and a third person from Kolkata. This was in April 1950 and at that time there was no passport control between India and Pakistan. I and my companion reached Kolkata by train and went to the central Tablighi mosque where we were joined by an Urdu-speaking gentleman who was made the leader of our three-member team. We started for Delhi on a train that took 24 hours to reach our destination. We prayed all the prayers on the train and our Hindu and Sikh co-passengers happily made space for us to pray. I was happy to know that our leader was Urdu-speaking, as I was keen on learning the language. I considered it to be a sweet language from my boyhood when I used to hear it during my trips to Dhaka with my mother. I learned a little bit from my cousins in Dhaka and also spoke some Urdu with my paternal grandmother after returning from Dhaka. I don’t remember these much but heard about it from my mother and grandmother. I also realised later that the Urdu my mother spoke was not the standard form of the language. As our leader lived in Kolkata he understood Bangla well, so it was easy for us to learn Urdu from him. During my involvement in the language movement I had decided that I would not learn Urdu, but my anger towards the language could not be sustained, and I learned the language with enthusiasm. It was relatively easy for me to learn as many words in Urdu are taken from Arabic. However, although Urdu used Arabic script I initially found it difficult to read as there were no diacritical marks like those in Arabic. Our leader helped me learn how to read. The Tablighi Jamaat headquarters were situated in a small mosque in an area called Nizamuddin in Old Delhi. The Central President of the movement at that time was Mawlana Yusuf, the son of the founder of Tablighi Jamaat, Mawlana Iliyas, who used to live in that mosque’s premises. All the speeches in Delhi were in Urdu. We were able to understand most of them, but speaking was a bit difficult as we were often worried about making mistakes. I and my companion from Dhaka were sent to a district called Bijnor with eight other members, under the leadership of Mawlana Ziauddin Aligarhi. I was hugely impressed by the personality of Mawlana Aligarhi, and learned a lot of things from him. He was our leader, but he never let us look after him; rather he would always be prepared to look after us. He was such an impressive leader that he never needed to order us to do anything. We got used to doing whatever was required without his order. I had never seen a leader as successful until then. Later when I was given the leadership, I tried to follow his style, but I do not think I was as successful as he was. Before returning to Dhaka we spent three days in Delhi. This time I enjoyed the speeches of the Central President of Tabligh, Mawlana Yusuf (popularly called Hazratji) even more as my Urdu had improved considerably by then. When I was leaving Delhi it was an emotional moment to part from my dear leader Mawlana Aligarhi, whose personality had a huge impact on me. I cried a lot hugging him and found it difficult to stop. He also shed tears and gave me some valuable advice that I remembered for the rest of my life. He was one of the few Tablighi leaders who did not make rude comments about my joining Jamaat-e-Islami. As my first Chilla was in eastern Bengal I wanted to visit northern and southern Bengal for the third one. I started for Dinajpur by train as the leader of a 15-member group. During the journey when it was time for prayer, I spoke about the importance of praying in congregation. Although it was meant for my fellow Tablighi brothers, I spoke loudly to also convey this message to many other passengers in the compartment. One of us did the call to prayer and we observed that quite a few of our fellow passengers were prepared to pray with us. Others moved away to allow us more space to pray. I spoke about our activities in Tabligh after the prayer and invited others to join. Later four or five passengers who were going to Dinajpur joined us in a mosque for two days. Although it was not part of the activities of Tabligh, I introduced something that impressed everyone and all the passengers followed this during the journey. When the train stopped at a station everyone would help passengers to get down with their luggage and help those people getting on the train with their luggage. We also ensured that elderly people, women and children had seats, by giving up our own seats. I told my companions to give up their seat when an elderly person was standing as Islam teaches us to respect the elders. I still remember the beautiful scene how younger people, including those who were not in our delegation, gave up their seats for the elders during that journey. This proves that people do possess basic human qualities; the problem is this feeling is not encouraged much. The sense of humanity is universal. After spending three days in Dinajpur, we went to Rangpur and stayed in a famous mosque called Keramatiya Mosque. The Imam allowed us to stay there but did not seem too keen on our cause. He later joined Jamaat-e-Islami and told me that he had never found the Tablighi movement appealing as it lacked the revolutionary approach that he had been looking for, being inspired by the works of Mawlana Abul Kalam Azad and Allama Iqbal. After spending three days each in Rangpur, Bogra, Pabna and Rajshahi, and a few days in some other places on the way back to Dhaka, I finally completed my three Chillas. I returned to our house in Moghbazar and met my parents after spending four months on the spiritual tour of Tablighi Jamaat. This tour changed my life forever. I decided, while in Rangpur, that I would take up college teaching as my profession rather than becoming a government officer. In this way I would be able to perform Chillas during the vacation. After my MA results, I sent letters to four colleges and, incidentally, I was given an offer from Rangpur Carmichael College – the same city where I had decided to take up this profession. Individual or collective supplications, often following ritual prayers. The fifth of the five daily prayers Muslims perform, prayed in the late evening. Supplications to God, often performed in Arabic and including verses from the Qur’an. A Persian word meaning forty days of spiritual journey. A northern district in Bangladesh. An Indian scholar and a senior political leader of the Indian independence movement. Following India’s independence, he became the first Minister of Education in the Indian government. Sir Muhammad Iqbal, widely known as Allama Iqbal, was an academic, philosopher, poet, barrister, mystic and politician in British India who is widely regarded as having inspired the Pakistan Movement.